Recent years have been less celebratory when it comes to Christmas Bangkok, last year (2016) due to the passing of King Bhumibol, and the years before that with the restrictions on fun by Thailand’s military government. The commercial districts will otherwise celebrate the festive season for three or four months, and I remember the flagship trees at Central World and Siam Paragon were once erected in early November (2014) after being taken down just eight months earlier in March. That’s 4 months of Christmas in Bangkok. When every major mall of the city will be decorated in over-the-top Christmas trees and festive baubles. And it is of course all about shameless commercialism, given Thailand is a Buddhist country, and Christmas is pretty much void in traditional rural part of the country. But I am in no way complaining, as the frills and excitement of Christmas in Bangkok, make the cheer of the festive season among the best in the world. The best of the Bangkok Christmas lights are found between the Chit Lom Skytrain station and the Siam Skytrain Station – the most popular being Central World, Bangkok’s middle-class mega mall. At Central World the activity square which fronts the mall hosts Bangkok’s tallest Christmas Tree along with other over-sized ornaments, fountains and open-air beer gardens – all sponsored by big brands of course. In the evenings Central World is swarming with youngsters being cute with cameras and iPads. The Beer Gardens each year include Tiger, Chang and Singha who sport their own brands, live performances and beer cheer girls (waitresses). Below are images of Central World over the years (2011, 2012, 2013). And here’s the full experience on Central World in 2013. Walking the elevated skywalk from the Chit Lom Skytrain Station to Central World you will pass the Amarin Plaza. Always some interesting Christmas decoration here. 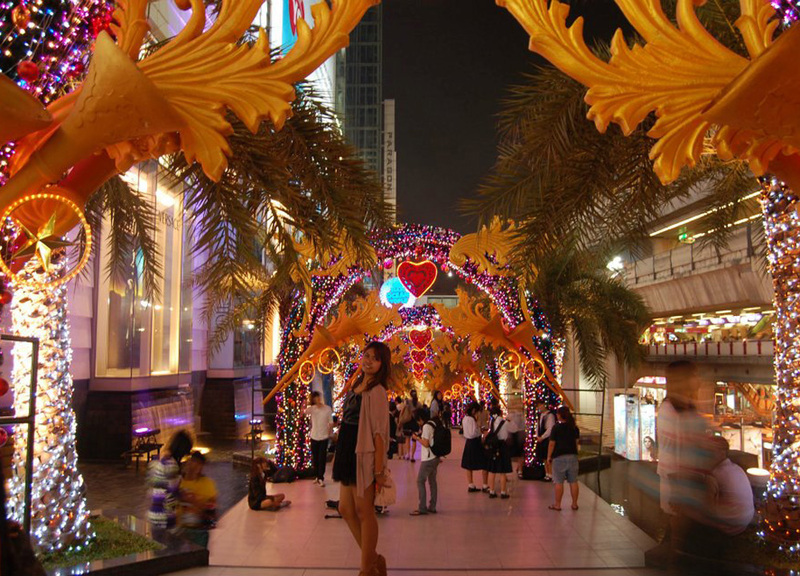 Then to the second best for Christmas in Bangkok is Siam Paragon located next to the central Siam Skytrain Station. Siam Paragon is Bangkok’s luxury mega mall. The tree at Siam Paragon lights up from the inside – blue, green, red, white – it has remained the same the past 3 years. Next to it is a walkway lit up with decorated arches and surrounded by fountains. The images below are from 2011.